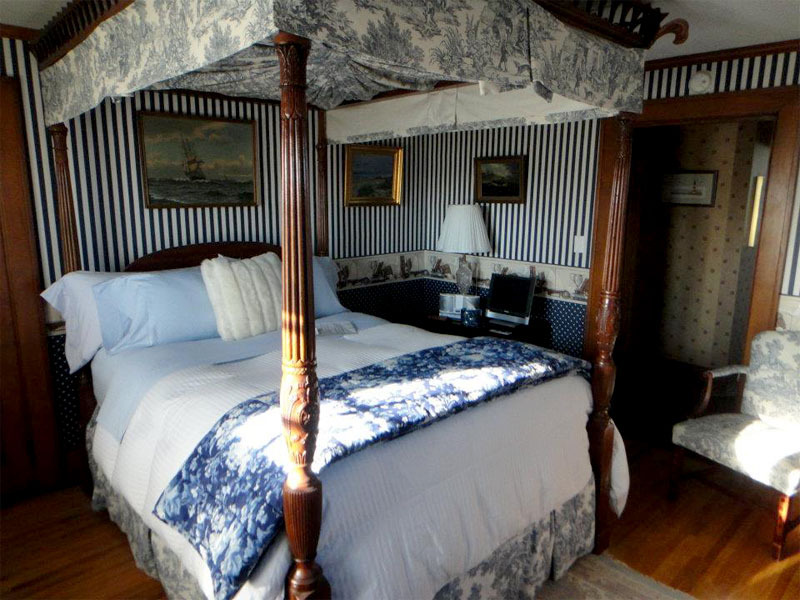 This magnificent suite, artfully color and theme coordinated, is named in recognition of Bellevue's location to Lake Erie and the many years spent by the owner in Rhode Island. The centerpiece of this suite is an impressive queen size Mahogany carved poster bed adorned with the prince of Wales' plumes. 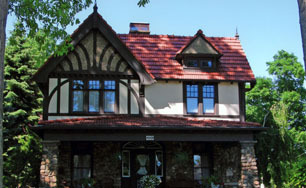 It is highlighted with a number of nautical paintings including the Lake Erie and Cape Cod regions. The dresser is unique, it is a ca. 1900 mahogany piece from Boston, hand painted with enamel scenes from Japan, and amazingly it is artist signed. Additionally, a beautifully carved 19th Century ship captain's table is used for a side bed table and holds a LCD flat screen TV with 155 cable channels. A comfortable couch, chair and a desk also compliment the suite. And a walk–in closet is part of this suite. 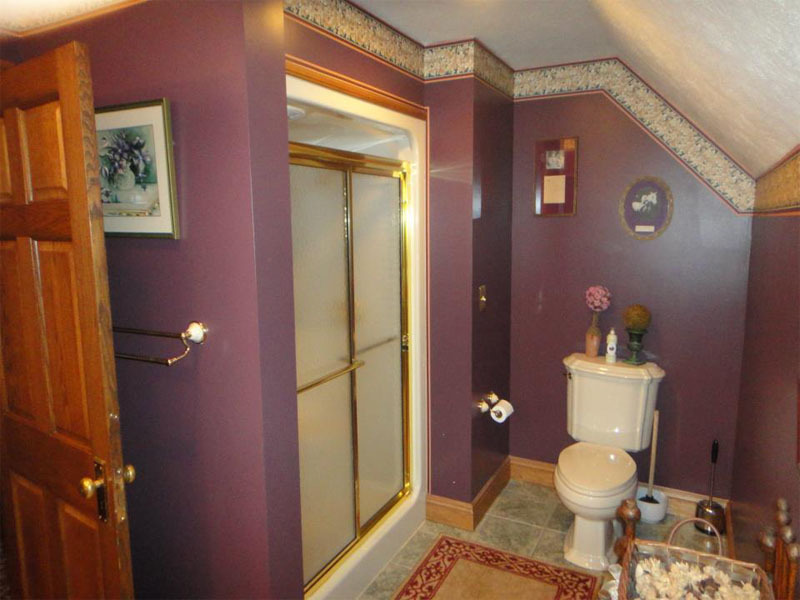 Oh, but wait till you see the bathroom, connected to the bedroom via your private foyer. 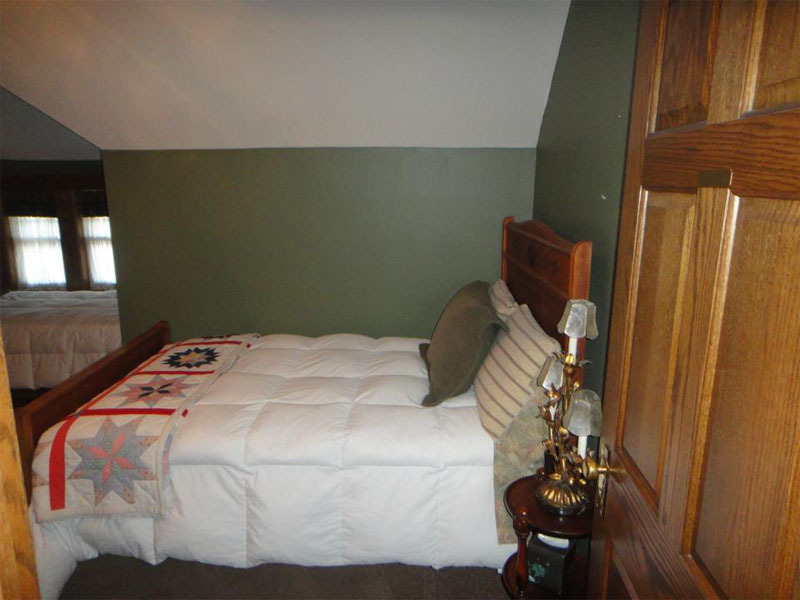 A very spacious room, completely renovated in 2007, awaits your various needs. Enjoy the two person Jacuzzi with our special soaps and lit candles. 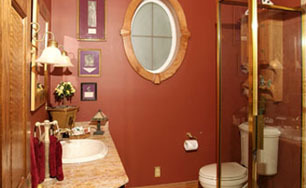 There is also a brand new installed two seat shower, which is separate from the Jacuzzi. 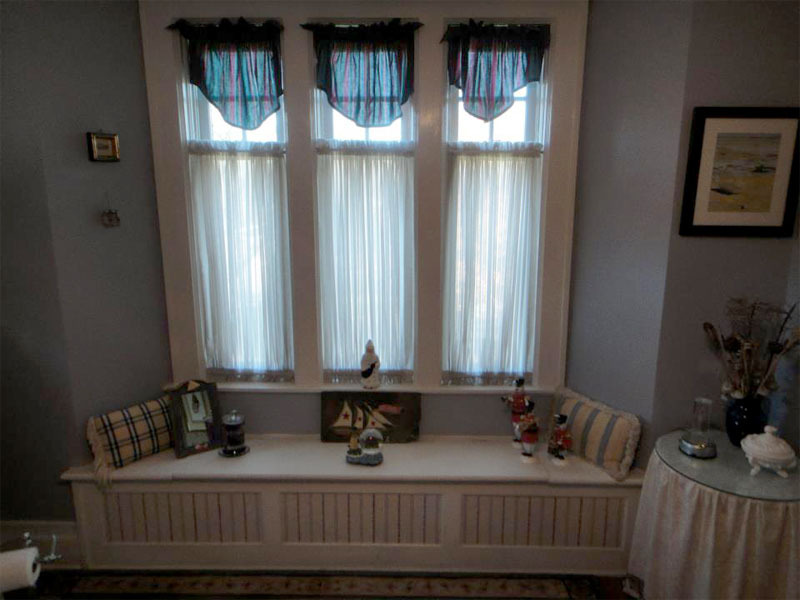 Enjoy your privacy while appreciating the extensive sunlight pouring in from the windows, especially those on top of the period window seat. 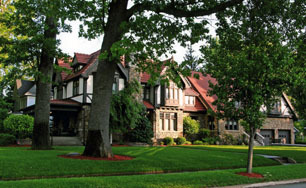 Winter Rate (Nov 4 – May 19) : $155 per night. 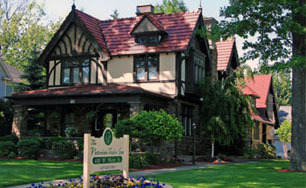 Summer Rate (May 20 – October 30) : $165 per night. Each person beyond 2 is $15 each. 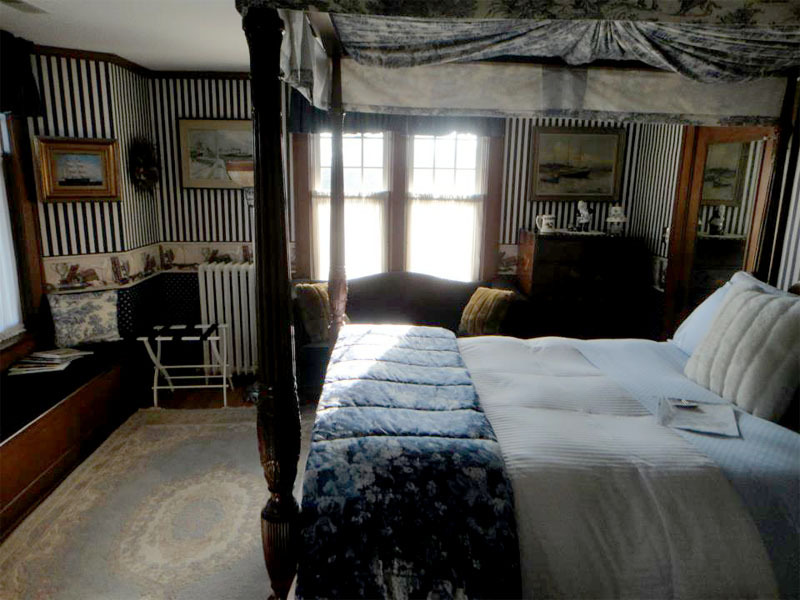 Upon first entering this room one is struck by the unique wallpaper and then by the magnificent two 19th Century full size beds. 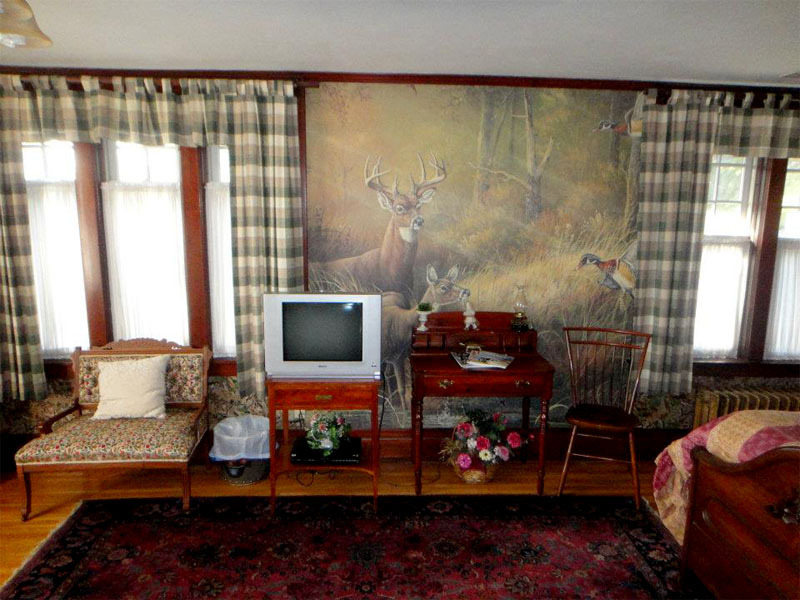 The wallpaper is a celebration of the wonderful wooded scenery surrounding the city of Bellevue, full of deer and wildlife. The beds, one dating from the civil war, the other ca. 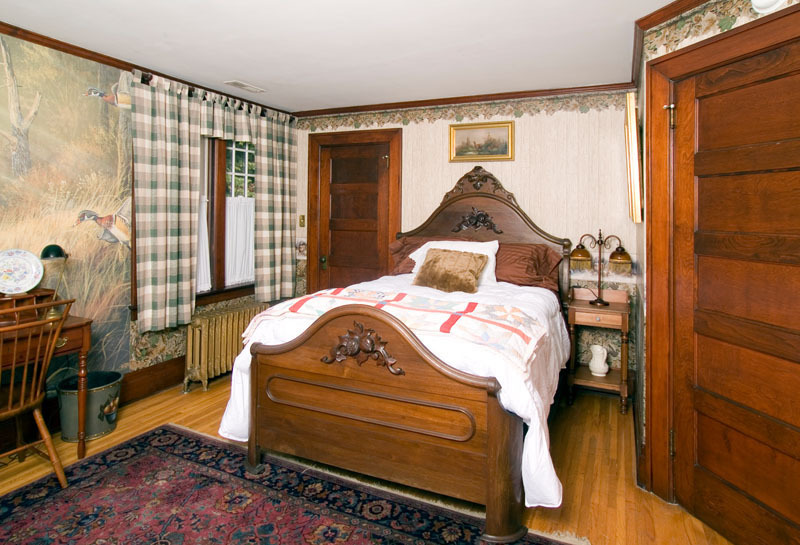 1880, with new Serta mattresses, provide a restful evening, accommodating up to 4 adults (the extra bed is also perfect if you are traveling with children). 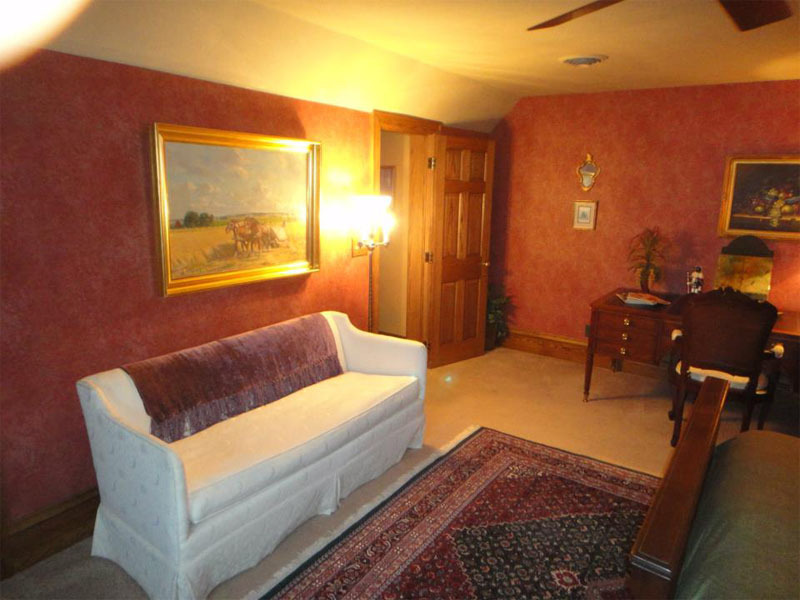 This room is "overseen" by King ,a wonderful 1899 folk-art painting of a loyal and trusted hunting dog. 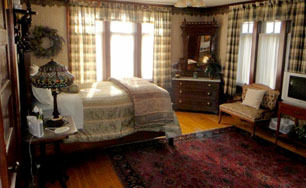 Other similar theme antique paintings adorn the room, along with 19th century Staffordshire china pieces. 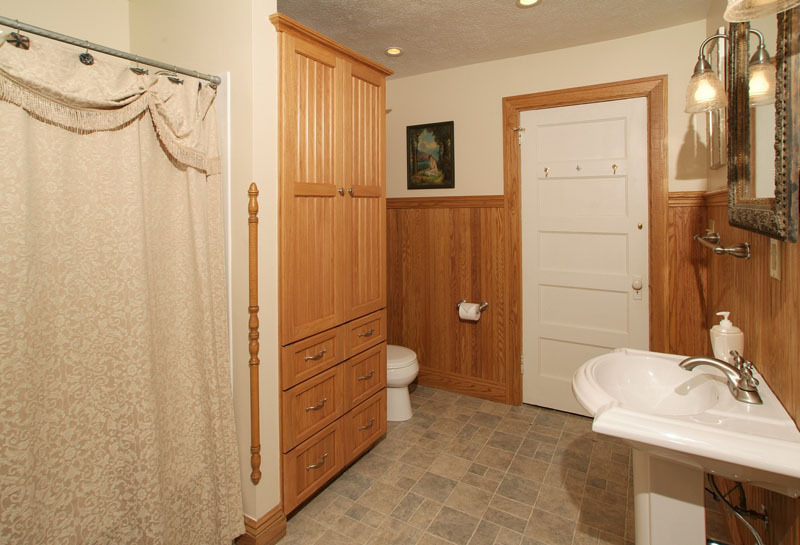 Our guest will appreciate the private entrance to their spacious bathroom via a newly constructed archway. And of course there is an IPod/clock/radio and TV with 155 cable channels. A new addition to this room is a 28" flat screen high definition TV. 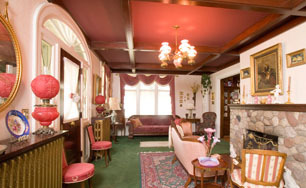 For your comfort the room also has a Victorian era love seat and a lovely mahogany desk for writing those postcards. 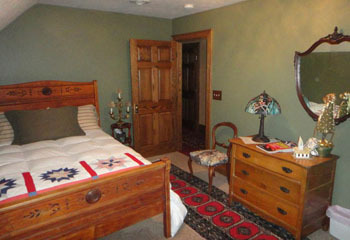 Winter Rate (Nov 4 – May 19) : $150 per night. 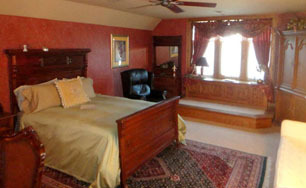 Summer Rate (May 20 – October 30) : $160 per night. 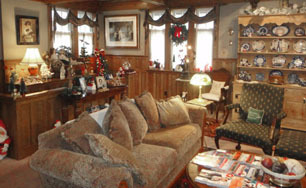 This large two bedroom suite is named for the original owners and business leaders of Bellevue. 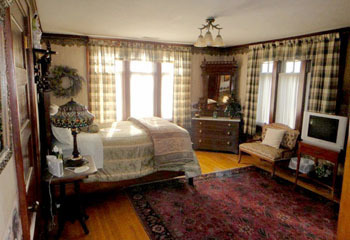 The main bedroom is quite large and contains a Queen size ca. 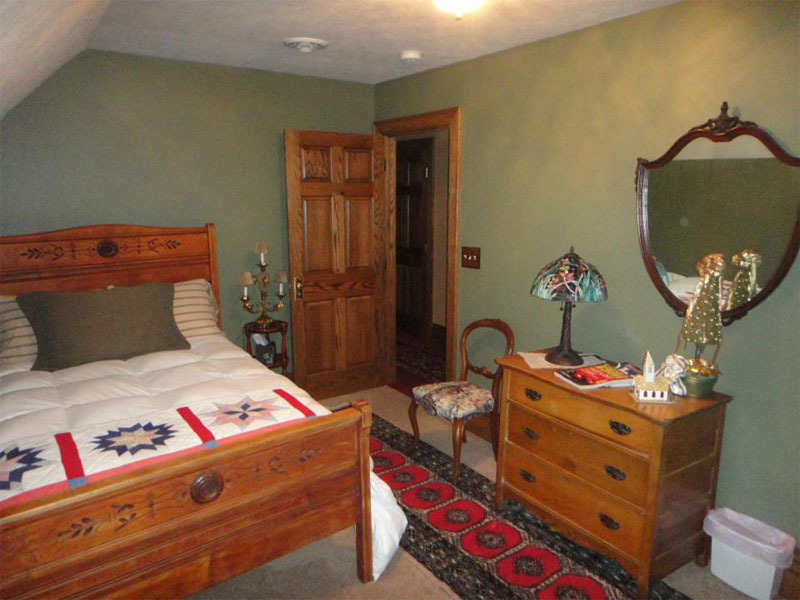 1870 carved bed (with new pillow top Serta mattress) with matching marble top bed table and dresser. An oak Armoire, beautifully hand carved, holds the TV. A special feature of this room is the awesome cherry and leather banker's desk, in the style of the 19th Century. Accompanying this large desk is a high back leather desk chair. A separate, elevated sitting area provides a wonderful reading space adjacent to the luxurious flowing drapes. Also for your comfort is a tastefully re–upholstered ca. 1920s couch in a rich, soft white star and moon fabric. 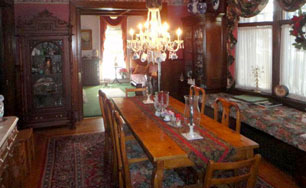 Antique glass, china, and lighting fixtures provide a wonderful touch to this special suite. colorful paintings, purchased during the owner's European trips, depict various scenes that gracefully compliment the spacious bedroom. 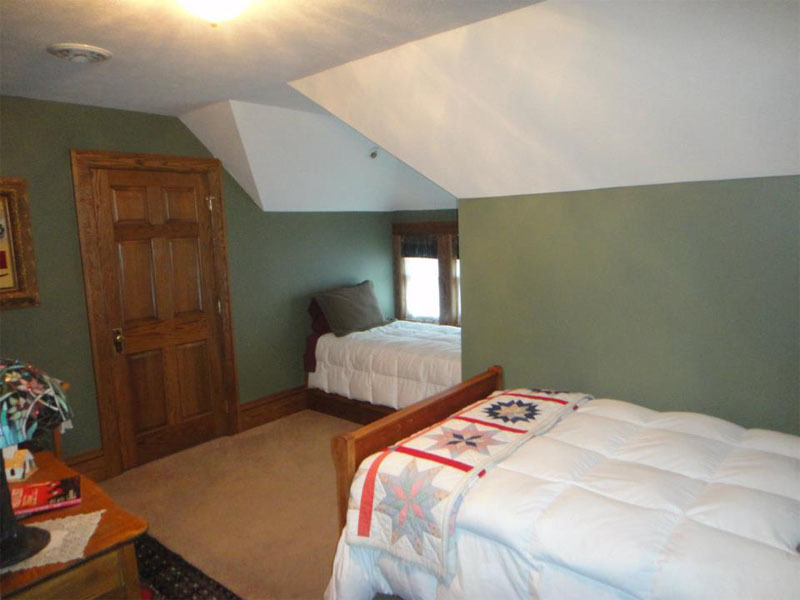 And of course to go with a large bedroom one needs a large walk-in closet, which it has! 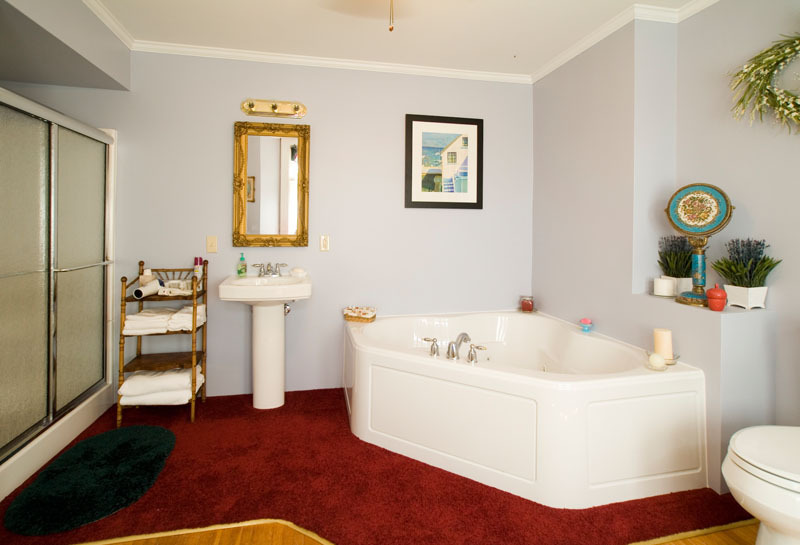 The "gem" of this suite, is the bathroom, which is accessed via the suite's private hallway. 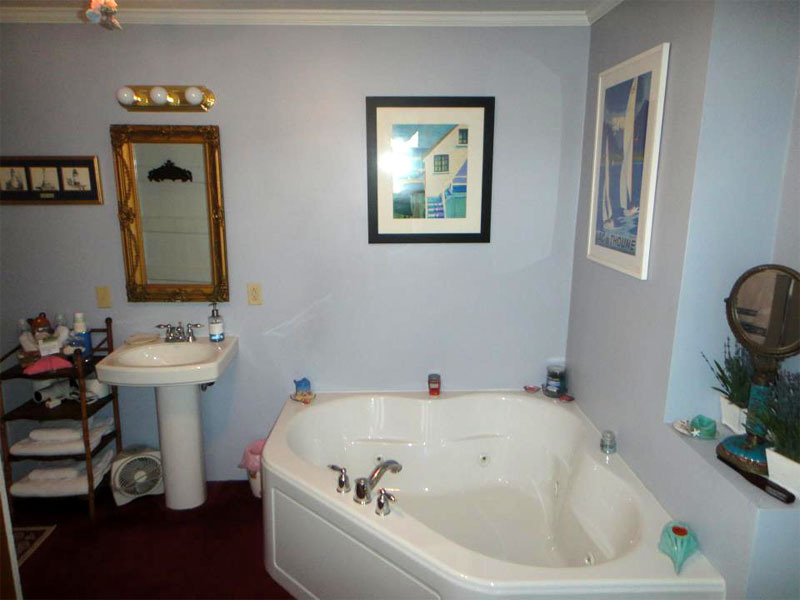 The large Jacuzzi, surrounded by the bathroom's granite, is an escape all by itself. Special lighting and candles help provide many relaxing moments. 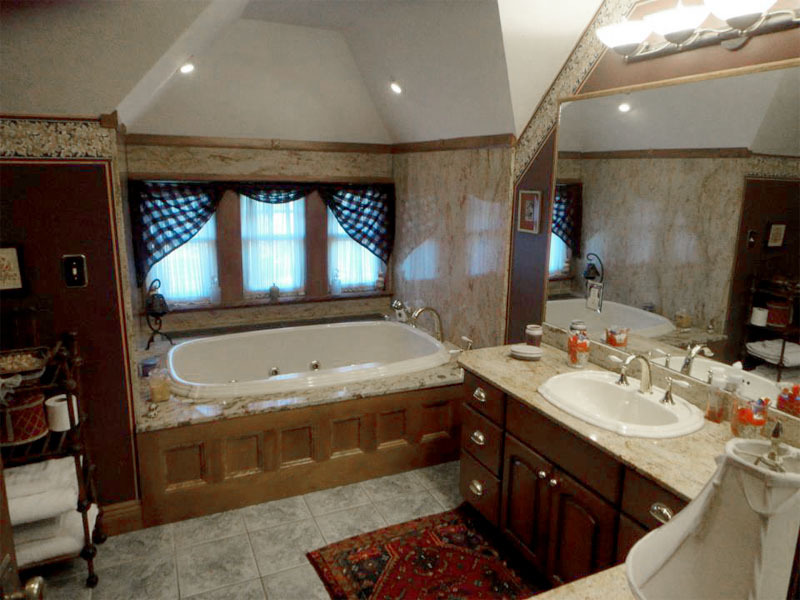 The granite sink top, which is quite large, wraps around two walls as do the large mirrors. 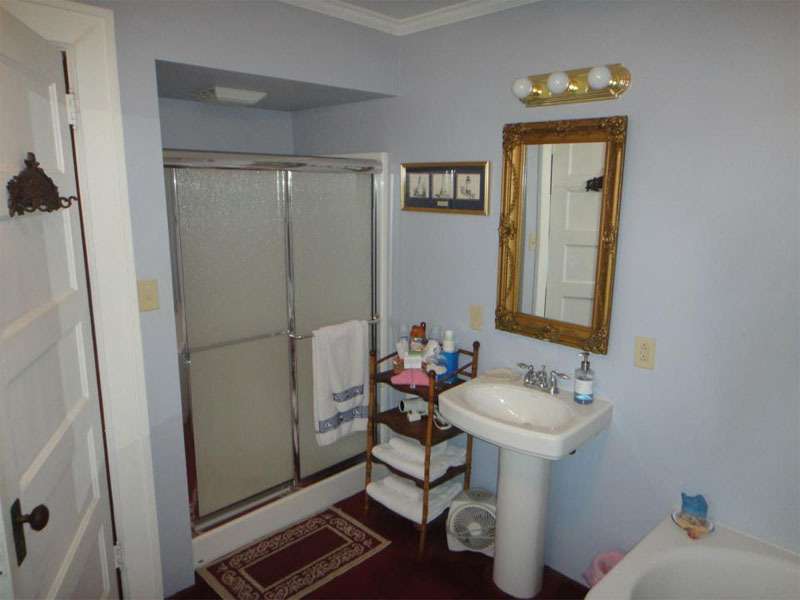 One also has the option of using the large two person shower. This room can be rented by our guests who rent the Greenslade Suite. 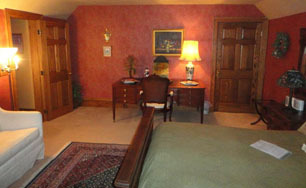 This separate room is in the same suite and will share the Greenslade bathroom. 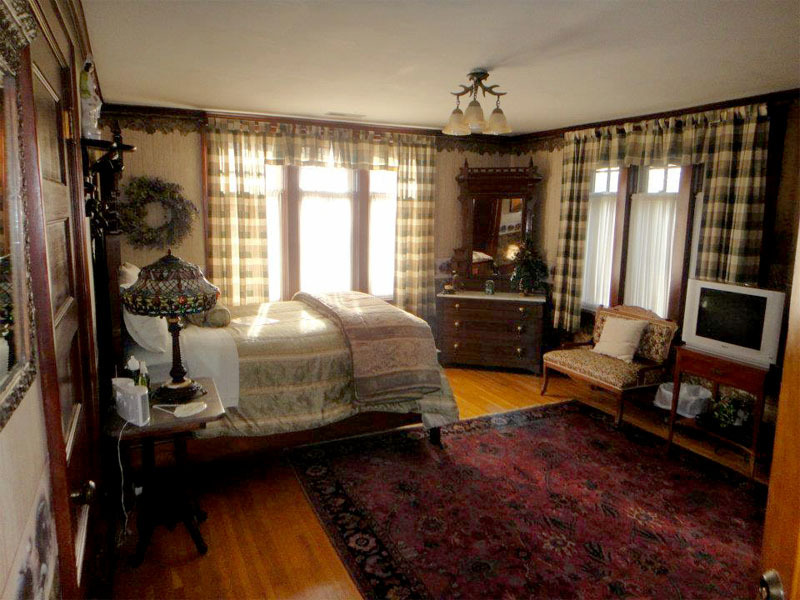 The room contains a civil war era spoon carved bed and also contains a large, single size bed window seat. Victorian era furniture adorns the room including a wonderful oak wash stand with ca. 1830s soft paste wash bowl and pitcher. 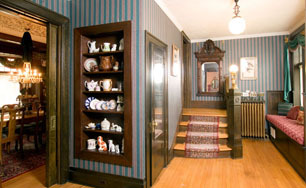 A large walk-in closet is provided. 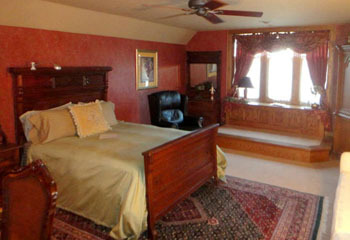 This room comfortably sleeps 2 – 3 people. 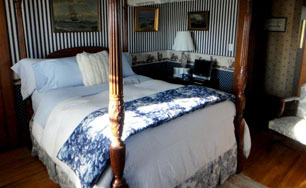 It is ideal for friends or two couples traveling together or those traveling with mature children. 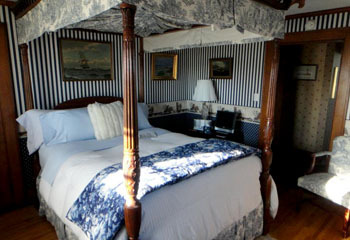 New purchase for the Royal Oak; Now comfortably sleep a third person in this suite with the addition of a wonderful Victorian Eastlake "Daybed". This wonderful find is in great, solid condition with beautiful new fabric. It folds to make a comfortable full size bed. 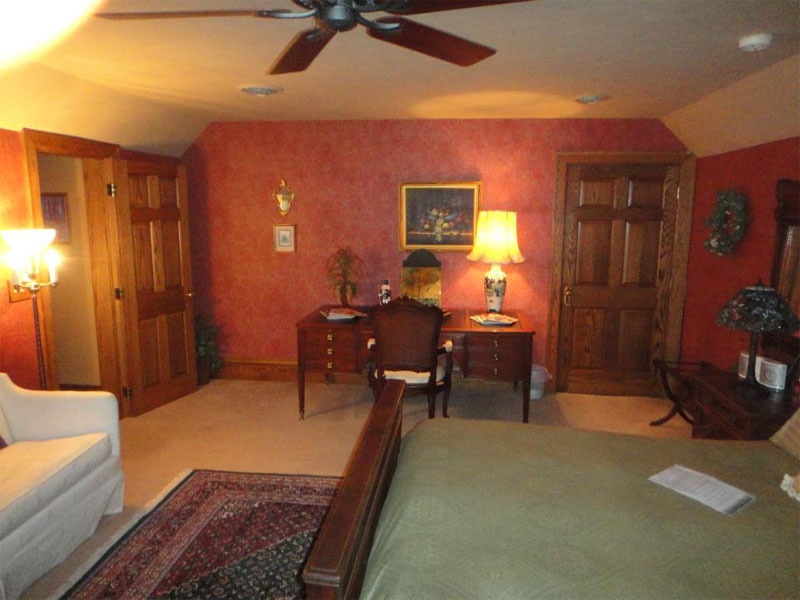 This suite is located on the first floor with 12' ceilings and beautiful Oak crown molding. 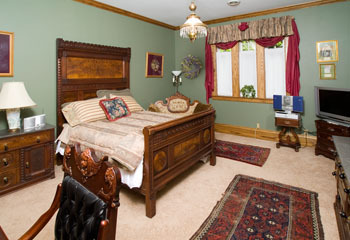 The bedroom is tastefully decorated with a magnificent three piece Victorian Aesthetic Movement marble top bedroom set. 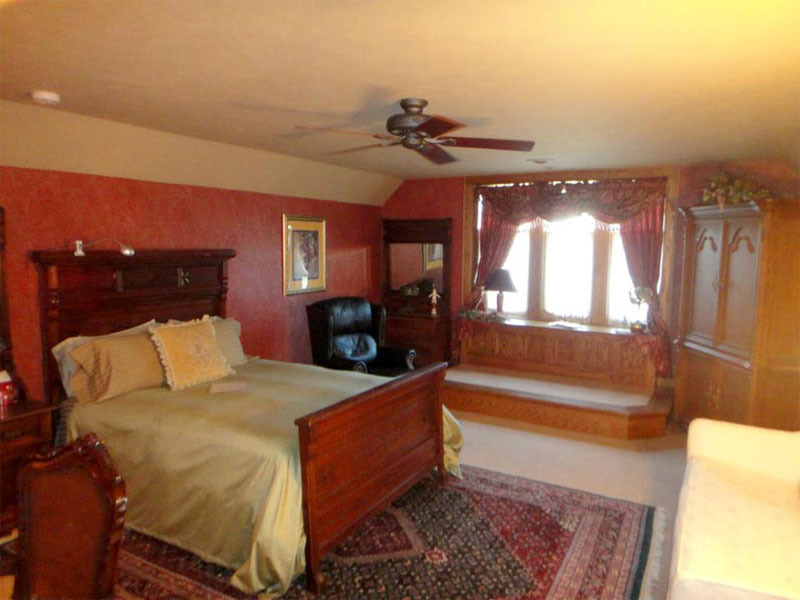 The queen bed has a 10 foot hand carved headboard. 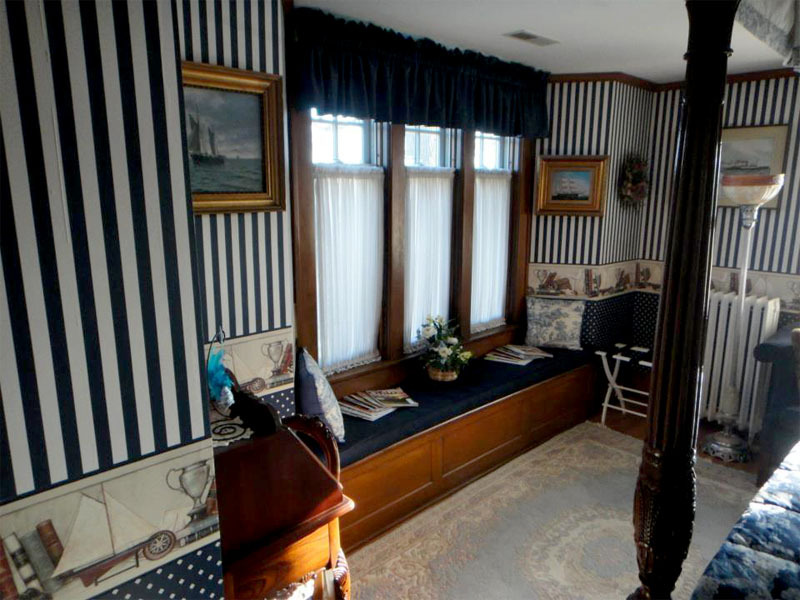 It is further accented by one of the best Victorian era love seats that one can find. A vintage cherry desk with a lovely Cherub carved chair provides for you writing needs. A lighted, spacious closet with several hanging levels accommodate your clothes. As a special treat, the guests of this room also have a 32" Zenith flat screen high definition LCD TV with 155 channels. 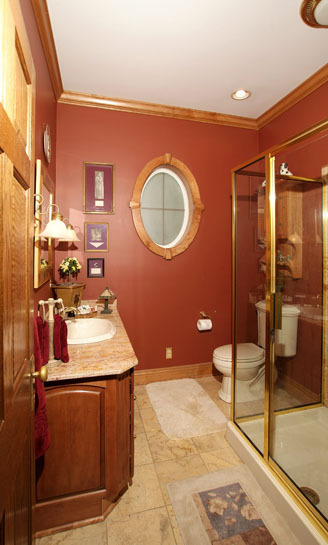 The bathroom is wonderfully adorned with granite, both on the vanity and the walls of the shower. And, the floors have radiant heat for those cool mornings. $20 nightly charge for third person.